Crazy creatures in Parliament are definitely the last thing you'd expect amidst the yelling and general rawkus. In some London eras however, there appears to be just that. 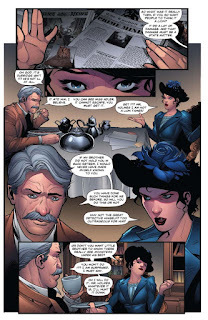 That era is in Swords of Sorrow; Dejah Thoris & Irene Adler #1 from Dynamite Entertainment. The issue is written by Leah Moore, illustrated by Francesco Manna, colored by Inlight Studio and lettered by Erica Schultz. Irene Adler has been many things in her young life, a fugitive, a master of disguise and a femme fatale, but even she is surprised to find herself made bounty hunter, tracking savage foes across the grimy streets of London. In a far off world, defending Barsoom against an influx of trespassers, Princess Dejah Thoris is ready to put the guilty to her sword. Now, the world-colliding events of Swords of Sorrow have brought these dangerous women together...and the fate of planets hang in the balance! Swords of Sorrow is Dynamite's most recent universe-spanning event and it's bringing in some of their key characters. 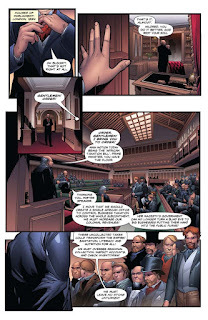 Moore's work in Swords of Sorrow; Dejah Thoris & Irene Adler #1 is no exception, as it spends the majority of the issue getting the reader reacquainted with Irene Adler. Dejah Thoris is a character who's pretty clearly established in the Dynamite universe, so it makes sense that Moore pays more attention to Adler in the issue as a means of viewpoint and getting the story to where it needs to be. The issue loosely ties into the larger narrative being crafted as part of the Swords of Sorrow crossover, as both Dejah and Irene are a little confused as to why their paths are crossing. 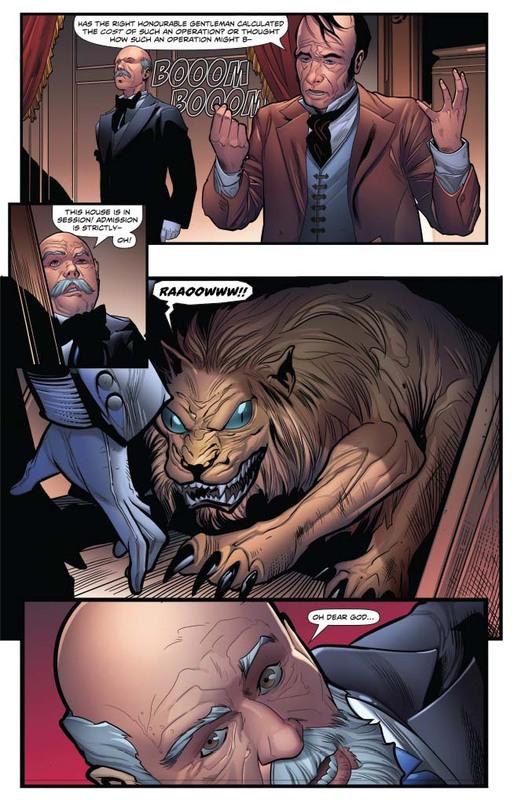 There's a pretty interesting twist tied to their paths that Moore relies on to carry the series as well. 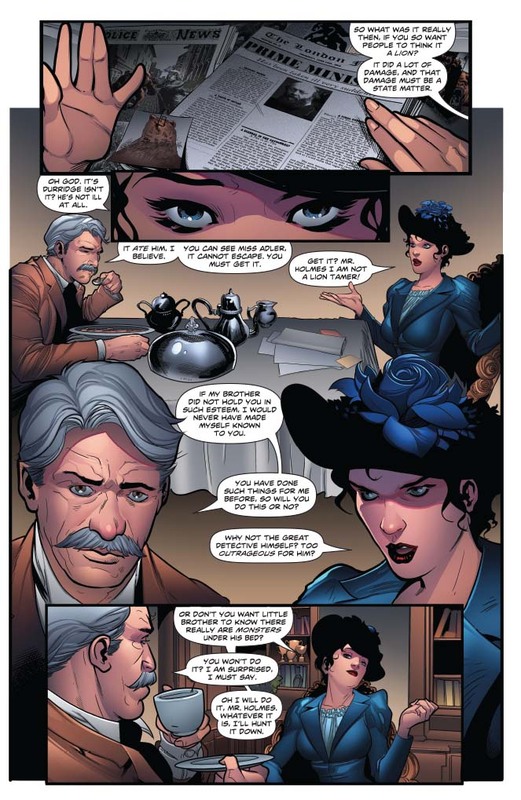 Artistically, the characters in Swords of Sorrow; Dejah Thoris & Irene Adler #1 are pretty easily recognizable to readers. 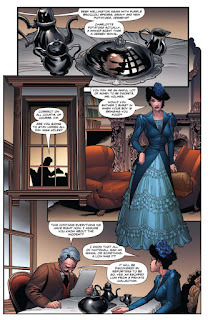 Irene Adler has a prim sensibility to her that belies an innate fighting talent. Dejah Thoris is clad in her typical garb, yet there are some instances where her appearance is a little too manly. 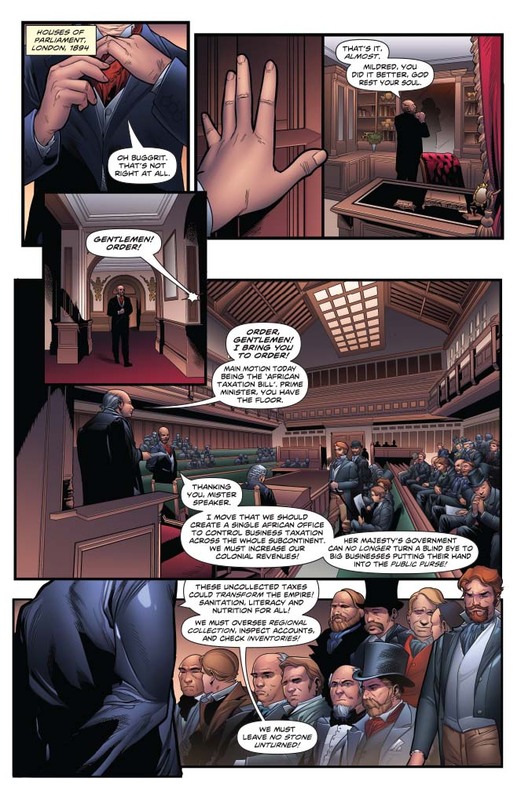 Aside from the main characters, Manna uses a variety of other characters to fill out London, pretty cleanly representing the aristocracy of the time. The panel layouts do feel a little overwhelming, as many pages eschew the more traditional grids for a flurry of insets and overlays. 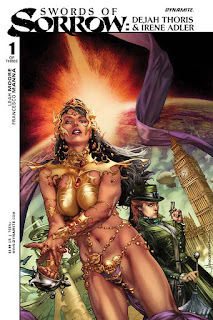 Swords of Sorrow; Dejah Thoris & Irene Adler #1 is an interesting crossover that promises to get a little weirder before it all starts to make sense. It's readily apparent that both Irene Adler and Dejah Thoris have parts to play in the coming conflict, yet how they'll influence events still remains to be seen. Moore's story is pretty straightforward and boasts a certain charm that comes from the ferocity of the two leading ladies. Manna's illustrations are pretty clean, even if there is something of an overabundance of scattered panels peppered throughout the issue. Swords of Sorrow; Dejah Thoris & Irene Adler #1 is definitely worth checking out if you're following along with Dynamite's foray into bringing their characters together. Swords of Sorrow; Dejah Thoris & Irene Adler #1 is available in stores now.